Here we go, then: Jet Li falls off a cliff and is cured of his ‘Jinxed Palm’ injury after learning the ‘Cosmic Solar Stance’ from a bearded monk chained to a giant rock. He then flies around the Seven Kingdoms with Chingmy Yau exacting revenge on the Evil Sect masters responsible for the suicides of his parents (his father dies following a spontaneous heart explosion). 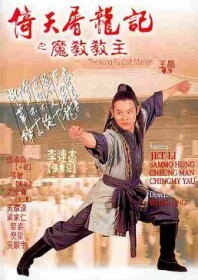 The villains are Master No-Mercy – a kung fu mistress with a sacred glowing sword who kills just about everybody she encounters – and the elegant but treacherous Chao Min, who flies in and out of the film without much explanation. This joyously chaotic fable features a cast of thousands and an utterly bewildering narrative, but still remains great fun.